April 15, 2019 • CATEGORIES: CJ-2A • TAGS: Odd Body. (02/22/2019) This was originally for sale in 2010. 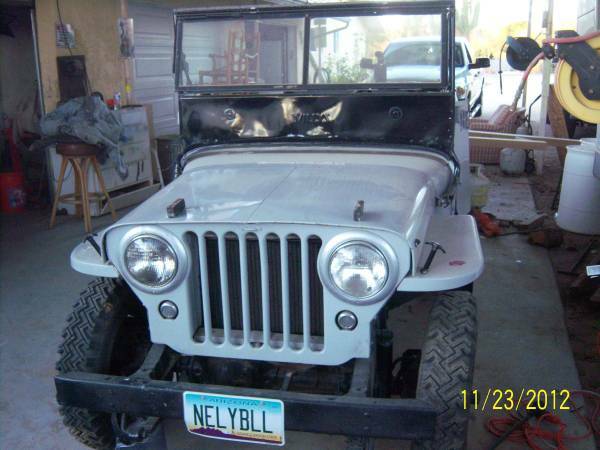 “This 1946 CJ-2A is an exact replica of the Jeep Nellybelle used in the Roy Rogers’ TV Show of the 1950’s. It was commissioned by Roy Jr., aka Dusty Rogers. 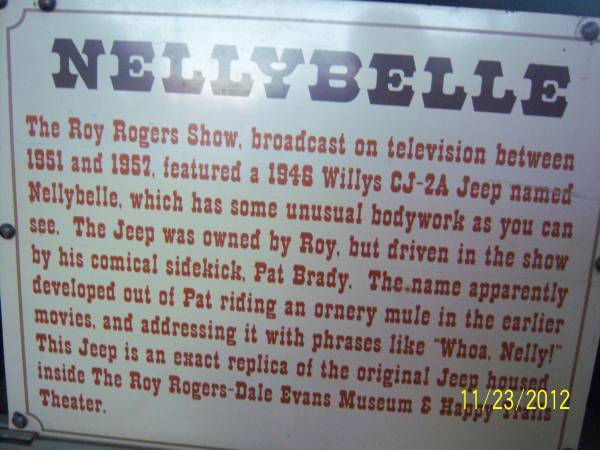 It was used at the Roy Rogers Museum for the children to climb into so that the original Nellybelle would not get all that “abuse”. We have the Certificate of Authenticity as well as pictures we took with Dusty and his son, Dustin. We are also friends with the fine gentleman who built this jeep for Dusty. pat brady was a real DUMBELL !! he didn’t deserve to drive a JEEP ! This almost seems like a scam. Even as a clone, with “History and documentation of celebrity ownership connections”, but with No current pics, or any pics at all, on the link, and only asking $10K??? Why wasn’t it at a auction? If I recall correctly, the original Nellybelle and Trigger too both went to South America after a tour of the USA on display, with the buyer from the Museum sale. Maybe somebody has specifics on that? Ten years is a long time for sale trying to sell a piece of nostalgia, truth is how many people alive today remember Pat Brady and Nellybelle. Other than the “Nostalgia factor”, this is just another CJ2A Willys Jeep. Not to put it down, just being realistic as to why it’s still for sale. While we’re on this subject, I am old enough to remember watching Roy Rogers on a black & white TV as a child in the early 1950’s. 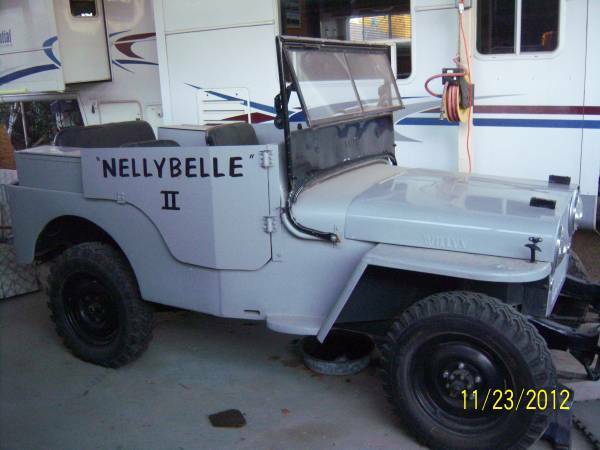 Somewhere along the line of episodes, the CJ2A Nellybelle became a CJ3B Nellybelle. I’m sure this had to do with product placement & promotion and the introduction of the NEW CJ3B. My question being, when we say Original, which one are we talking about, the CJ2A or the CJ3B? If I remember correctly, the big money auction was for the CJ2A, so what happened to the CJ3B? Inquiring minds want to know. Not that it really matters in life, just trivial little factual information that make life meaningful, to me anyway. Thanks for your time and consideration. Steve: I did some searches, but couldn’t find any evidence there was a tour of South America. Given there was extensive touring of America and Canada (http://www.bobnolan-sop.net/Biographies/The%20Story%20of%20SOP/Pat%20Brady/Pat%20Brady.htm) it is certainly possible there could have been a visit to South America. Agree , never saw or heard of a cj3b ‘Nellybelle’ . The seller clearly states it is a reproduction and was never in the show ,so what’s the problem ? To the commenter who wrote negative comments about Pat Brady , he was an actor , musician , and war hero , so what’s your problem ? My memory for detail on this plays through my mind like it was yesterday. As a child, I did a double take when I viewed the CJ3B. Even if you knew nothing on this subject, there was one dead giveaway, The original 1946 CJ2A was filmed without the windshield in the up position. In it’s place was a panel with a slot to the right so the stunt man could see where he was going. Because of the higher hood on the CJ3B, that panel was not needed. That was the dead giveaway. I still have my plastic CJ3B that was included in the Ideal toys Roy Rogers Chuck Wagon play set. Also have a vintage pic of Pat & Nellybelle. This kind of stuff, makes my day enjoyable, so much better than working, going brain dead at the BIG ORANGE BOX STORE. Once again, i feel alive. The 1956-1957 season was season six and the final year, so you were right there. I looked through several season 6 episodes via youtube and a few other sites (list of episodes … https://en.wikipedia.org/wiki/List_of_The_Roy_Rogers_Show_episodes), including the final episode “Johnny Rover” ( http://thefilmdetective.tv/video/the-roy-rogers-show-s6-ep-15-johnny-rover-1957/5989f2e09099fd1314006cca/ ), but didn’t see a 3B, only a 2A. I’ll look some more later. Dave, Just to add to the continuing saga, At least one of the episodes had both the CJ2A for close up shots, and the CJ3B for a really quick, (few seconds) distance shot of 3b climbing a baron hill. You had to look fast to catch it. Most of this stuff, the ordinary audience wouldn’t notice. I’m sure it’s out there, but don’t go crazy looking for it. This stuff always turns up when you’re NOT looking for it. More rewarding that way. Steve … my bad! I misunderstood. It’s possible Derek isn’t aware of it. Mike … I’m just crazy enough to look. 🙂 I’ll revisit some of those episodes. I have been to the Roy Rogers Museum several times, before it was closed. And I only saw one Nellybelle and it was behind glass and never saw a second Nellybelle for kids to climb on. I miss the Museum. 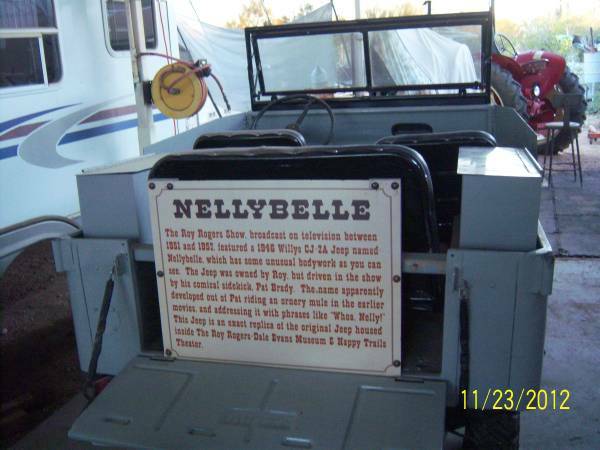 From what I undertand, there was clone of the original Nellybelle and when the original went up for auction, there were warnings to make sure the original Nellybelle was correct. The lady who bought the original is from NY and housed Nellybelle in truck museum in eastern PA that belonged to friend of hers. I understood Trigger went to the RFD TV network in the midwest. A couple of years ago, the lady wo bought Nellybelle wanted to sell her, but was unable to recoup her investment of approximately $115,000.